A talk by Zuzana Rihova. 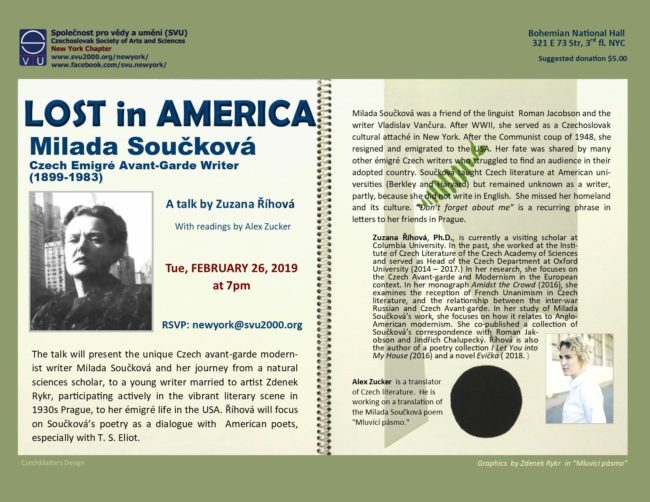 The talk presented the unique Czech avant-garde writer Milada Souckova and her journey from a natural sciences scholar, to a young writer married to modernist painter Zdenek Rykr, participating actively in the vibrant literary scene in 1930s Prague, to her émigré life in the USA. Ríhová will focus on Soucková’s poetry as a dialog with American poets, especially with T. S. Eliot. Milada Soucková was a friend of the linguist Roman Jacobson and the writer Vladislav Vancura. 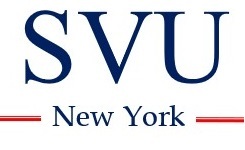 After WWII, she served as a Czechoslovak cultural attaché in New York. After the Communist coup of 1948, she resigned and emigrated to the USA. Her fate was shared by many other émigré Czech writers who struggled to find an audience in their adopted country. Soucková taught Czech literature at American universities (Berkeley and Harvard) but she remained unknown as a writer, partly, because she did not write in English. She missed her homeland and its culture. “Don’t forget about me” is a recurring phrase in letters to her friends in Prague. Alex Zucker is a translator of Czech literature. He is working on a translation of the Milada Soucková poem Mluvící pásmo.